Murray is set to join the Saints on a four-year, $14.4 million contract, Adam Schefter of ESPN reports. Murray is scheduled to become an unrestricted free agent in March and is hoping for the opportunity to compete for a starting job, Andrew Krammer of The Star Tribune reports. "I want to start. I'm not content with being in a backup role," Murray said Monday. "I want to compete, and Dalvin [Cook] knows that. We push each other. That's what it's about. But I would love to be back here for that opportunity to compete." Murray ran for 22 yards on nine carries and added two catches for six yards during Sunday's 27-9 win over Detroit. Murray rushed 15 times for 68 yards and a touchdown in Sunday's 41-17 win over Miami. He wasn't targeted in the passing game. Analysis: Murray scored Minnesota's third touchdown of the first quarter courtesy of an 18-yard run, handing his team a 21-0 lead. 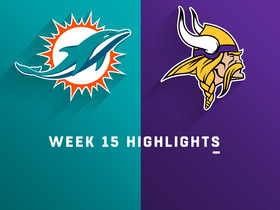 Playing from ahead throughout, the Vikings gave 15 carries to Murray and 19 to Dalvin Cook. Cook was the much more explosive running back with 136 rushing yards and two touchdowns, so Murray's owners will need to hope that Minnesota races out to a similar early lead against the Lions in Week 16 for Murray to have a realistic shot of replicating this performance. Murray rushed three times for four yards in Monday night's 21-7 loss to the Seahawks. Analysis: Murray was again used sparingly while working behind Dalvin Cook, whose 13 carries marked his most since Week 1. Cook also scored through the air, where Murray was not targeted once. With four or fewer carries in three of his last four outings, Murray's stock has returned to that of a backup tailback in need of an injury ahead of him to carve out more significance. Murray had four carries for 11 yards and two receptions for three yards in Sunday's loss at New England. Analysis: Murray played just 12 snaps compared to 47 for Dalvin Cook (who had nine carries for 84 yards). Cook looked sharp (9.3 YPC) and back to full speed after earlier hamstring issues, so Murray could be relegated to a decreased role in the final four games of the regular season. Murray carried the ball 11 times for 33 yards in Sunday's 24-17 win over the Packers. Murray had four carries for five yards in Sunday's loss to Chicago. Analysis: Minnesota's running game struggled as the team gained just 22 yards on 14 carries. However, the bigger worry for Murray's fantasy value is that he played just six snaps on offense compared to 59 snaps for Dalvin Cook. With Cook back to full speed after missing time with a hamstring issue, Murray may move back to a much reduced role. Murray rushed 10 times for 31 yards and a touchdown while catching his lone target for 16 yards in Sunday's 24-9 win over the Lions. Analysis: Murray was outplayed by the returning Dalvin Cook (hamstring), who turned 10 carries and four catches into 109 scrimmage yards. Despite his lack of yardage by comparison, the veteran running back managed to salvage his fantasy day thanks to a one-yard rushing score on the opening drive. Murray could see his role drastically decrease after Minnesota's Week 10 bye if Cook's deemed healthy enough to operate as the primary backfield option. Murray may lose 15-to-20 snaps to Dalvin Cook (hamstring) during Sunday's home game against the Lions, Courtney Cronin of ESPN.com reports. Murray carried the ball 13 times for 56 yards and a touchdown and caught five of six targets for 39 yards in Sunday's 30-20 loss to New Orleans. Analysis: Dalvin Cook (hamstring) remained out of action, allowing Murray to lead the backfield for yet another week. The veteran was able to overcome a tough matchup against the Saints' No. 1 ranked run defense, gaining 4.3 yards per carry and finding the end zone for the third consecutive week. Cook may not return until after the team's Week 10 bye, so Murray should be in line for another heavy workload against the Lions on Sunday. 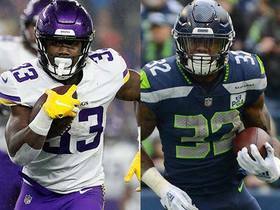 Murray is primed to lead the Minnesota backfield in Sunday's game against the Saints in the expected absence of Dalvin Cook (hamstring), Matthew Coller of 1500 ESPN Twin Cities reports. 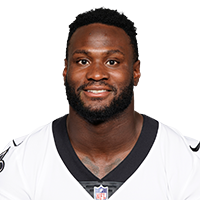 Analysis: After piling up 224 rushing yards and three touchdowns against the Cardinals and Jets the past two weeks, Murray will face a bigger challenge in Week 8 versus a Saints team that has limited opposing running backs to 2.8 yards per carry and 48 yards per game. Cook hasn't been ruled out by the team, but he didn't practice Wednesday and reportedly isn't expected to return until after the Vikings' Week 10 bye. Murray rushed 15 times for 69 yards and two touchdowns while catching both of his targets for 14 yards in Sunday's 37-17 win over the Jets. Analysis: Murray scored from 11 yards out in the third quarter and added a 38-yard touchdown in the fourth. He's come alive over the past two weeks, tallying 224 yards and three touchdowns on the ground with Dalvin Cook sitting out due to a nagging hamstring injury. The 28-year-old running back would be in line for a feature role against the Saints on Sunday Night Football in Week 8 if Cook's unable to make his return. Murray is expected to serve as the Vikings' starting running back Sunday against the Jets with Dalvin Cook (hamstring) ruled out for a third straight game, Chris Tomasson of the St. Paul Pioneer Press reports. Murray rushed for 155 yards and a touchdown on 24 carries and added a three-yard catch during Sunday's 27-17 win over Arizona. Murray will start at running back with Dalvin Cook (hamstring) inactive for Sunday's game against Arizona. Analysis: Even though Cook has missed two games due to injury and has been limited to 18 snaps in another one, Murray has yet to make a major impact. Murray has totaled just 106 yards on 30 carries (3.5 per attempt) and nine receptions for 60 yards while failing to find the end zone through five weeks. Still, that could change against a struggling Arizona defense that's 31st in rushing yards allowed per game. Murray could work in a timeshare with Dalvin Cook (hamstring) during Sunday's game against the Cardinals, as Cook is only expected to see the field for around 20-to-25 plays, Ben Goessling of the Minneapolis Star Tribune reports. Murray carried 11 times for 42 yards and caught two passes for 14 additional yards during Sunday's 23-21 win over the Eagles. 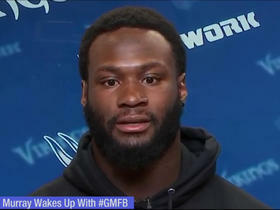 Murray rushed for two yards on two carries and added 16 yards on two carries during Thursday's 38-31 loss to the Rams. Murray carried twice for one yard and caught five of seven targets for 30 yards during Sunday's 27-6 loss to the Bills. With Dalvin Cook (hamstring) ruled out, Murray will be the Vikings' starting running back Sunday against the Bills. Analysis: After Cook was lost for the season with a torn ACL in 2017, Cook earned 11 starts, averaging 17.6 touches and 71.4 yards from scrimmage per game while scoring six touchdowns. This time around, Jerick McKinnon isn't present to steal touches, meaning Murray should be a bell cow in Cook's absence. Murray carried four times for 19 yards during Sunday's 29-29 tie with the Packers. Analysis: Murray received just two touches during regulation, but he finished the overtime period with a pair of carries to set up a field-goal attempt which Daniel Carlson ultimately missed. His involvement increased after Dalvin Cook left with an apparent hamstring injury, though Cook said after the game he was merely dealing with cramps. With this in mind, Murray should once again serve as Cook's backup Sunday against the Bills, though he could see additional work if the score gets out of hand. Murray had 11 carries for 42 yards in Sunday's win over the 49ers. Murray had 10 carries for 24 yards, including a one-yard touchdown, in Friday's preseason win over Seattle. Analysis: Murray bounced back after struggling in his previous preseason game with two fumbles. Dalvin Cook got two carries in Friday's game, showing he's set to return from last year's torn ACL. It's not clear if the Vikings will ease Cook back into action and use Murray more at the early points of the season, but Murray could carve out a goal-line role in any scenario. Murray had six carries for 12 yards and fumbled twice (losing one) in Saturday's preseason loss to Jacksonville. Analysis: After an explosive performance in the first preseaon game (four carries for 48 yards), Murray struggled Saturday against a better defense. His fumbles likely are not a worry since he's never had a history of turnovers. His playing time early in the season will likely depend on whether the Vikings want to ease Dalvin Cook back into action after returning from an ACL injury. Murray rushed four times for 48 yards during Saturday's preseason opener against the Broncos. Murray restructured his contract with the Vikings, Andrew Krammer of the Minneapolis Star Tribune reports. Vikings general manager Rick Spielman suggested Wednesday that Murray isn't guaranteed to return to the team in 2018, Andrew Krammer of the Minneapolis Star Tribune reports. "We've discussed a lot of things," Spielman said when asked if the Vikings were set with Dalvin Cook (knee) and Murray as the team's primary running backs next season. "We're very excited, Dalvin continues to rehab. We're very excited about the progress he's making and anxious to see what we are with him in the fold along with whatever combination is there." Murray rushed six times for 18 yards while bringing in both of his targets for 11 yards during Sunday's 38-7 loss to the Eagles in the NFC championship game. Murray rushed 19 times for 50 yards and one touchdown while catching both of his targets for 17 yards during Sunday's 29-24 NFC divisional-round victory over the Saints. Murray had 20 carries for 111 yards and two touchdowns in Sunday's win over Chicago. He also had one reception for three yards. Analysis: Murray finishes the regular season with eight rushing touchdowns. He has eight in his last ten games after getting a larger workload after the season-ending injury to Dalvin Cook in Week 4. He should be set to get a heavy workload again in Minnesota's playoff game at home after a bye. Murray notched 21 carries for 69 yards and caught his sole target for six yards during Saturday's 16-0 win in Green Bay. Murray rushed 20 times for 76 yards and a touchdown while adding a 28-yard catch on his lone target in Sunday's 34-7 drubbing of the Bengals. 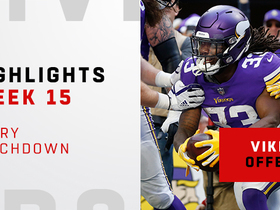 Analysis: Murray got the scoring started with a one-yard plunge in the first quarter and was clearly the go-to rushing option over Jerick McKinnon (nine carries for 24 yards). While McKinnon made his mark with over 100 yards as a receiver, Murray remains the better bet for short-yardage scores. The former Oakland running back now has six rushing touchdowns in his past eight games. Murray said he still deals with general soreness in his surgically repaired ankle, Chris Tomasson of the St. Paul Pioneer Press reports. Murray rushed nine times for 14 yards and caught both of his targets for six yards in Sunday's 31-24 loss to Carolina. Analysis: Murray got two more touches than Jerick McKinnon, but gained 35 fewer yards from scrimmage. The former Raiders running back came in with 323 yards and four touchdowns on the ground over the previous four weeks, so this performance should be viewed as an outlier rather than a precursor of more struggles to come. Murray carried 16 times for 76 yards and caught all three targets for an additional 21 yards during Sunday's 14-9 win over the Falcons. Murray rushed 20 times for 84 yards and a touchdown during Thursday's 30-23 win over Detroit. Analysis: Somewhat quietly, Murray has now compiled 399 rushing yards and five scores through his past five games. He continues to split snaps and carries with Jerick McKinnon, but the timeshare hasn't significantly hindered the fantasy value of either back. After all, a two-man committee in a high-volume rushing attack still provides plenty of opportunities. Additionally, Murray's value is buoyed by his usage near the goal line, as he's now up to 27 red-zone carries through the past eight games. Murray rushed 15 times for 95 yards and two touchdowns while also hauling in his only target for one yard in Sunday's 24-7 win over the Rams. Murray rushed for 68 yards on 17 carries and scored a touchdown in Sunday's 38-30 win over Washington. 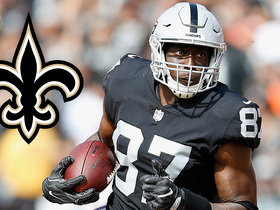 NFL Network's Herbie Teope explores how the additions of tight end Jared Cook and running back Latavius Murray will impact the New Orleans Saints' offense in 2019. 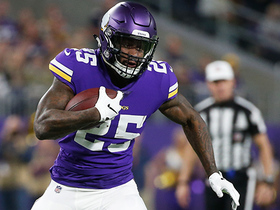 Vikings running back Latavius Murray talks about wide receivers Stefon Diggs and Adam Thielen. 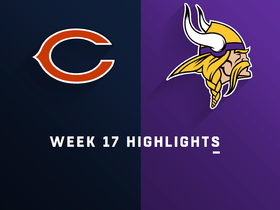 The Chicago Bears lean on their running game and defense to defeat the Minnesota Vikings 24-10 in Week 17 of 2018. 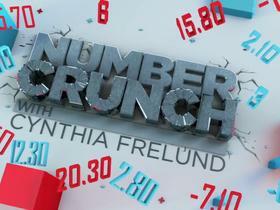 NFL Network's Cynthia Frelund projects how Week 15's top performers will fare in Week 16. 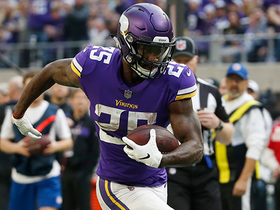 Minnesota Vikings running back Latavius Murray stiff-arms defenders for an 18-yard touchdown run. Seattle Seahawks linebacker Bobby Wagner tackles Minnesota Vikings running back Latavius Murray on fourth-and-one. 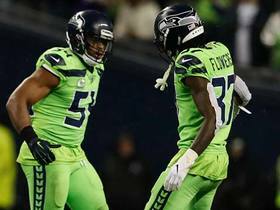 NFL Media Senior Fantasy Analyst Michael Fabiano and NFL Network's Matt "Money" Smith project how many points the running backs will have in the Monday night matchup between the Minnesota Vikings and Seattle Seahawks.